the proverbial lot – MostlyAboutBeer……..
At the start of 2017, Red Squirrel Brewery announced there would be big news and triggered a countdown on social media for the twentieth of February when all would be revealed. 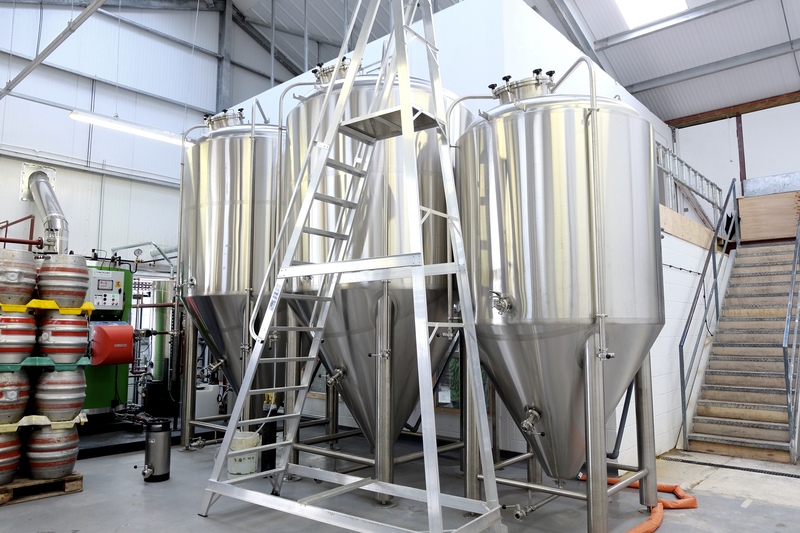 The brewery already boasted four tap rooms in Amersham, Chesham, Berkhamsted and High Wycombe as well as the brewery itself in Potten End, just outside Hemel Hempstead. I recall thinking the news would probably be about another outlet – maybe in Aylesbury or Watford – as the brewery is looking to keep expanding its beer shops in the Chilterns. In a way, its model is similar to the regional brewery template with its tied pubs – but without the actual pubs. But in fact the news was of a rebirth – Red Squirrel ditched its neé identity to become Mad Squirrel. It also announced an expansion to the brewery which would open to the public with a pizza oven and hop garden. Its perceived image changed from that of twee, rural and folksy to that of the modern, edgy and lapel-grabbing. The delightful little rodent that used to bound ‘tail aquiver’ across the pump clips – became narcotised – an opaque mammal stare on a bright hallucinogenic dais. Fresh from the birth canal, the new “mad” identity suffered some negative feedback. Some engaged in dialogue directly with the brewery, others simply re-Tweeted the crossover link with snide comments – effectively blanking the brewery out. It wasn’t quite the grand reveal Mad Squirrel had hoped for. Others that didn’t appreciate the change were original investors who had shares in the previous Red Squirrel brand and felt left out from any consultation. But there was a pincer movement: some on social media saw the move as muscling into a craft brewery culture – more of a Zeitgeist – that they didn’t feel Mad Squirrel should be a part of. It didn’t belong. What might’ve been anticipated were the comparisons made with Brewdog – both to the website brewery image (to be fair – it’s what the brewery actually looks like), and to the share holders being dubbed “equity nuts” when, obviously, the word equity had been employed by Brewdog for its own “punks”. This, understandably, was seen as no coincidence. I gauged these reactions on Twitter and there’s nothing out of the ordinary about online opprobrium, but there is a much bigger context here to do with tradition and imagery that would be difficult to have foreseen. The exchanges were at the same time uncomfortable and fascinating. In St Albans, one reaction I witnessed to the switch was customers eyeing the new badges in pubs and commenting on how the brewery would now abandon cask beer. This was associated with Cloudwater Brew Co forsaking cask just a month before. The wounds were still fresh, yet the only link between these two phenomena is change; it shows how feared it can be. This post isn’t so much about Mad Squirrel – though we will constantly be orbiting it – but what we the drinkers feel is and isn’t acceptable for breweries, what we want their backstory to be and where we find comfort culturally. I’m issuing a biopsy on the consumers themselves to make sense of the public reaction. Why is change so distrusted? We’re not always aware of branding. Or to be more precise, we’re not always aware it’s in our system. I have a memory of a holiday with my parents. We were sat in a pub at an inside table and I was turning a beer mat over in my hands. It was from what I now recognise as Hall and Woodhouse, aka Badger Brewery – and that animal was the image I was twirling around. The motif was different to the more aerodynamic version used now – that’s because other graphic designers have been employed since. I loved it. I’d quite like to have it in my collection now. The stylised foliage on that little piece of card forged a link between a beer I was too young to even drink, and the high hedges and tight curving roads of the west country. The nostalgia for the England I associate with pubs is actually the result of a brewery managing director and a design team. I think of sunken wells, itinerant dry stone wallers, clay pipes, ploughs, the shepherd and his flock. None of these particularly sync with the age I live in but it’s part of the language and syntax of anything remotely traditional in Britain. Tendrils reach out to the past – ensnaring wheat sheaves and corn dollies – and attempt to root themselves there. The imagery must be pre-industrial: hand carved, whet-honed, horse drawn. But when was the last time you saw a wench bearing pails on a yoke? If we were to use the agricultural and rural architecture of the present, we’d have twin tyre tracks climbing dye-straight through the crop sea towards a distant vanishing point, hay compacted into perfect geometric blocks or cylinders, grain silos, the twin irises of sewage farm aeration tanks glaring unblinkingly at the heavens, hulking alien water towers, flat roofed barns, oxidising husks of farm machinery, the postnatal glisten of wet tarpaulin caught in sunburst after rain. To me, pylons are perfect for pump clip art. They’re the sentinels of the British landscape joining us all up into our shared heritage. 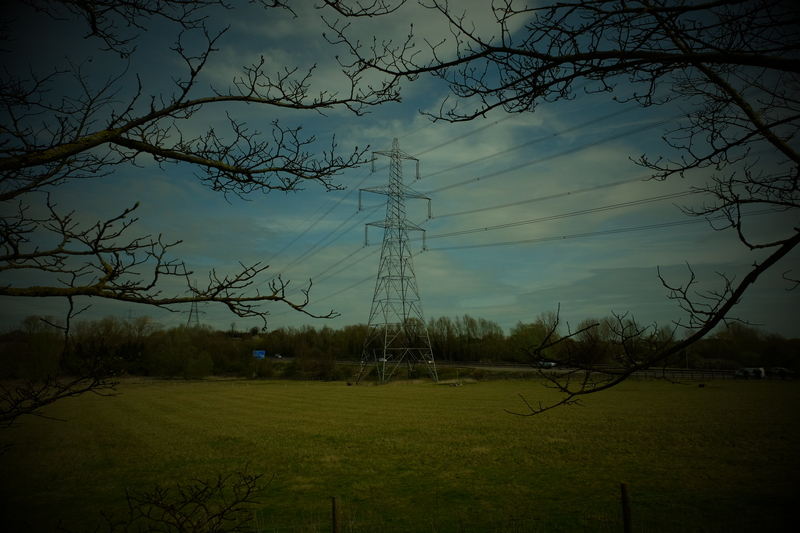 They whisper an excitable lilting patois across the wires in strong winds. All these things are transcendent. To be at one with the flush pink sky over the rolling hills of England, these are the kinds of sights that are unintentionally beautiful if you allow them to be, and they’re often within view of rural breweries. But we don’t allow them to be. They’re never used because they don’t form a part of our “consensus” roots. Uniqueness isn’t important when starting out as a rural brewery. West Berkshire Brewery or Chiltern Brewery can serve as examples. They were founded in the 1980s and 1990s and wear the glimpses of all things pastoral and bucolic in their finery. Though each is now branching out into craftier enterprises, they still trade on notions of Olde England. Don’t misunderstand me – I’m not knocking that culture – I’m drawn to it. I’m just making the point that breweries conform to an established comfort culture because that’s what makes our pupils dilate. I also highlight this to note how bizarre this yearning is, considering none of us would actually want to live in this bygone country with its lack of central heating, high mortality, consumption, back-breaking labour and arthritic pain. Yet that’s what gives us succour! Is that pint of Good Old Boy Bitter or Cobblestones Golden Ale supposed to be us reaping the reward earned from the hardships of our forebears? Where’s a sociologist when you need one? 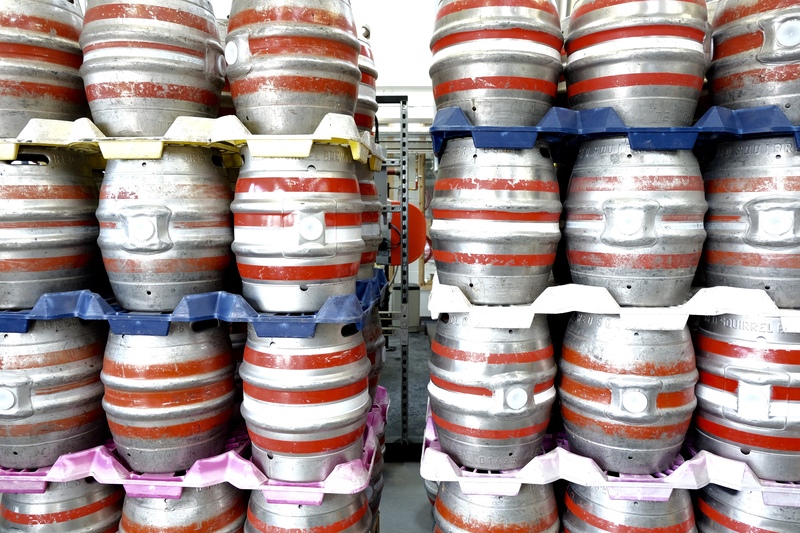 Subconsciously, might there also be an awareness that cask ale breweries are bringing out keg beer, whereas keg-only craft brewers are not pushing out into cask. With a few exceptions, the direction is one way and it’s tempting to see a chrome future where cask gets snuffed out. Any change by a brewery therefore, is seen subconsciously as a step on the road to banks of hop-forward keg beer, and cask ale extinction. But what about the culture Mad Squirrel is buying into? It’s harder for me to caricature the here and now as it’s constantly evolving. It’s a culture of contradiction where capitalism dons the hoody of socialism. The phrase “join the revolution! (clamoured) – by buying our products (mumbled).” is everywhere. It’s also a realm of psychedelia, graffiti and the undead. The age of crowd funding is upon us and it often works – especially to start a brewery up in the first place. But let’s be clear. Beer brewing is a capitalist enterprise however we tweak it. Something that relies on profit for mass production can’t not be. Beer is more representative of sociability than socialism. The notion of beer for the common people doesn’t quite fit in with modern craft brewing. It’s not for the peasants – they’ve been relegated to Wetherspoons – fast becoming the only place folk on minimum wage or drawing a pension can afford to eat and drink out. It’s the relatively affluent young with disposable income that make up craft brewing’s audience. But we still like to see brewing as an artisanal cottage industry done solely for love rather than profit. Currently, mix that notion of cottage industry with spray paint on back alleys and rabid animals and you have something approximating modern branding. Where’s that bloody sociologist gone? But since we’ve touched on the c-word, there is also a submerged fear the public has rekindled about buy-outs since the time of the Big Six – like the the cold war has returned – digitally remastered. What if announcements of expansion are in fact overtures not to us but to a bigger international concern that might take it over. Parts of Britain have become synonymous with brewing. In London’s case, it’s its boroughs more than its whole. I don’t think a brewery sharing the same brewing neighbourhood as Hackney, Bermondsey, Manchester or Bristol would have faced so much indignation when announcing change as Mad Squirrel did. Maybe there’s a simple reason for this: company. The brewers in these neighbourhoods know each other personally and it’s unlikely and inter-socially unwise for anyone to heap scorn on the other. They have a common dependence despite being each others’ competition. This is an unwritten insurance policy that bolsters mutual support on social media. They’re reliant on each other to grow each others’ wealth as they’re milking the same crowd. And furthermore, they’ll share many of the same staff. Mad Squirrel had nobody – an altered bat logo projecting into the sky from a field outside Hemel Hempstead. Is it more apposite, therefore, to quote a lack of street cred as a factor rather than website? The town of Hemel isn’t preceded by a reputation that carries any gravitas. Too much concrete to be rural, too much of a backwater to be urbane. Branding needs to effect the quickest possible shorthand. The squirrel face emblem is well-designed and is not only immediately recognisable in itself but by mere fragment: just the corner of the ear is enough to make the register ring it up. This also applies to the blue Brewdog hound, the beast’s face on Wild Beer Co, the woman in the Starbucks logo and the Volkswagen badge. When Kernel started using plain rectangular cards as its emblem, they became iconic. Subconsciously, it implies less is more – a narrative that works perfectly on the senses for that brewery. Since then, the market has become ever more crowded and it’s difficult to find a design that stands out. As previously mentioned, Mad Squirrel’s website was accused of mimicking Brewdog’s. But if this is true, it’s also the case for Kirkstall, Northern Monk, Bristol Beer Factory, Brewsmith and many others. As far as I know, they escaped criticism. They share a visual trigger – the brewery icon, professional photography of the brewery, sliding images, dark backgrounds and drop-down menus. This all makes sense – it’s completely practical. I’ll put my cards on the table: I was fond of the original identity and loved a discontinued ale called conservation bitter. It was fruity – to my palate, a bit like Boltmaker by Timothy Taylor. A percentage of the cost went to a red squirrel preservation charity. This explains the original brewery name. But the name was problematic at the same time – obviously there are no red squirrels in Hertfordshire (although there are black ones in the north of the county!) – the name never tied into anything native. Perhaps this longing for a chocolate box England that never was precedes my fondness for that bygone bitter. Sentimentality can influence palate. Mad Squirrel has an enviable trump card: it has a German head brewer with a degree from Weihenstephan (and a second one in training) – the qualification’s like a combination of physics and engineering. This is the kind of brewer that can brew a beer and get it to consistently be the beer that was designed, rather than inventing a backstory for one that was ad-libbed. Often when I read openers on bottle labels like “this beer was born from hours of contemplation and experimentation” what I actually read is “we don’t know what the hell happened but we’re running with it because we have no choice”. The gleaming new brewery also has the most sophisticated brewing equipment I’ve ever seen. It was made by A.B.E and is bespoke. There was a flat display panel that, once prodded by a finger, started a whirlpool going in one of the kettles. Usually when I visit breweries in Hertfordshire, the most hi-tech switch in the building turns the lightbulb in the ceiling on and off. So what is Mad Squirrel’s perception now we’ve had over half a year since the re-brand? Basically, it’s been absorbed. I can tell a Hopfest badge from across the other side of the bar from the luminescent green shield. People continue to drink their beer and the same pubs continue to stock it. I’ll be supportive of Mad Squirrel because of the investment it’s making – both in the state of the art brewery and qualified staff. But also because it’s a regional employer that keeps money in the local economy. It runs apprenticeships and its fifty-odd staff rotate in all aspects of the running: serving in the beer shops, the brewery and even taking out the mobile cruiser – a bar in a van. It’s a good employer to develop skills under. Also, it’s close to Alec. That counts for something, namely by him. And when other breweries across England adopt similar models, will there be accusations of trying to do a Mad Squirrel? Whatever your views of the re-brand and expansion, this phenomenon could be the start of something mirrored across the country. Needing to assure their future, reach a larger audience and keep with the times, we might see other grounded breweries undertake this catharsis and embark on their own transformations. Mad Squirrel may unwittingly have taken a few bullets on their behalf. Craft sub-brands are becoming increasingly common but it will be interesting to see if more go the whole hog and rebrand completely. And that’s the crucial difference I’m highlighting. Ditching an established name must seem like quite a risk. Interesting post – like you say – to ditch a recognisable name may be a risk, and that’s where the balance in moving with the trends and staying close to traditional approach needs to come in. Will be fascinating to see what the market makes of this move. Mad Squirrel actually adopted its craftier sideline (many trad breweries have them now to get a toe in the craft beer market). Mad Squirrel used to be an alias under Red Squirrel (I had to cut some parts out to lower the word count). But it will indeed be interesting to see what the market makes of this move. the Mad Squirrel strikes in Harpenden – MostlyAboutBeer……..